Please note that the content of this book primarily consists of articles available from Wikipedia or other free sources online. 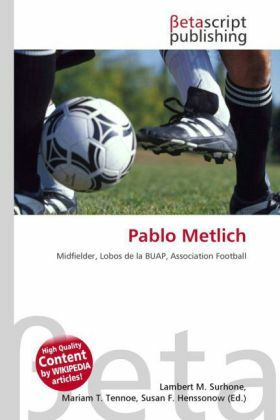 Pablo Arturo Metlich Ruíz (born 2 September, 1978 in Gómez Palacio, Durango, México) is a Mexican football midfielder who plays for Lobos BUAP. Metlich made his professional debut with Tecos in 2002.In association football, a midfielder is a player whose position of play (highlighted in blue on the diagram) is midway between the attacking strikers and the defenders. Their main functions are to dispossess (tackle) the opposing team, to retain possession of the ball, and to feed it to the strikers, and perhaps, to score as well.